In October, the New York State Museum in Albany put out a call for local artists to design wooden boxes to hold the remains of the Schuyler Flatts People for burial. A handful of proposals were accepted. Among them was a design by the fourth-grade class at All Saints Catholic Academy in Albany. "We found out we were accepted in the first week in January," said art teacher Krista Gillis. In fourth grade, students at ASCA learn about New York State history, making the project a perfect fit, said fourth-grade teacher Mary Schwartz. "We looked at what Schuyler Flatts was and where it was located," she said. "We talked about how slaves were in these homes. The students tend to think that slaves were only in the South." Bella Lucarelli, a fourth-grader, was surprised to learn that New York was active in the slave trade. "I didn't think it was right that slaves didn't have rights," she told The Evangelist. Although learning about the hard work that the slaves had to do every day was educational, Bella especially appreciated helping to carve the linoleum stamps the class used to adorn their burial box. 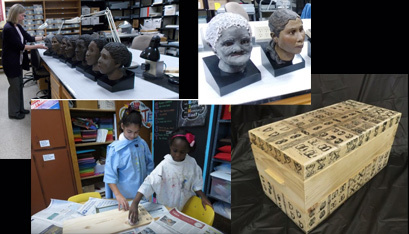 "We studied a certain kind of art [from] Ghana," said Ms. Gillis. The students looked through symbols whose meanings relating to slavery; each student chose a symbol for a stamp. "Mine was kind of like a square and there were little swirls on it," said fourth-grader Emily Coffey. "It meant 'to be trusting' and 'friendship.' I felt like [slaves] had to believe in each other." The box itself was made by Michael Terry, parent of a sixth-grader at ASCA. Although the topic of slavery can be difficult for children to learn about, Ms. Gillis thought her students really came to understand what they discussed. "It warmed my heart," said Cordell Reaves, a committee member for the Schuyler Flatts Burial Project who is also a historic interpretation and preservation analyst at the New York State Office of Parks, Recreation and Historic Preservation. "It's so complicated for people who are adults to accept, that New York was a major slave state. These kids get it and they wanted to participate in honoring these people. If these kids can get it and put forth their time and energy, then the adults need to follow suit." In 2005, while digging for a municipal sewer line, the remains of more than a dozen human bodies were unearthed by workers in Menands. They were found to be the bones of 18th-century slaves. In June, the remains will be reburied in St. Agnes Cemetery in Menands. Fourth-graders from All Saints Catholic Academy in Albany made one of the boxes that will be used to inter them (see sidebar). Since the remains were discovered nine years ago, they have undergone DNA testing that led to their identification as slaves belonging to the prominent Schuyler family, some of the first Dutch settlers in the Albany area and the owners of the land on which the bones were found. Philip Schuyler, who was a general in the American Revolution, resided at Schuyler Flatts in Watervliet and was the father-in-law of Alexander Hamilton, George Washington's top aide and a founding father of the United States. "We had a very active slave trade in New York," noted Kelly Grimaldi, historian for Albany diocesan cemeteries. "It's not a very much talked-about topic." Slaves, she said, "weren't even acknowledged as people, let alone citizens. I think it's time to bring [their contributions] to the forefront of New York's history." Slavery ended completely in New York in 1827, though there were laws passed that regulated it in 1799. Local residents are working to ensure the remains -- referred to as the "Schuyler Flatts People" -- get the reverence they deserve. On June 18 at 11 a.m., the bones will be interred on Founders Hill at St. Agnes Cemetery in Menands -- a site that's also the final resting place of the founder of the cemetery itself. "I think it's fitting that they are up there high on the hill with extremely prominent families," said Ms. Grimaldi of the slaves who toiled in anonymity and passed away so long ago. "They get to share in the company of the captains of industry. Before, they would be in an unmarked burial ground." Before the reburial ceremony, the remains will lie in state at the Schuyler Mansion state historic site in Albany June 17, noon-3 p.m.
"I don't know if people are generally aware that slavery was such a big deal in the Northeast," said Lisa Anderson, curator of bioarcheology at the New York State Museum in Albany. Although it was known that there was an active slave trade in the Albany area, the discovery in Schuyler Flatts of the bones of people with African descent solidifies that theory. By examining the Schuyler Flatts remains and testing their DNA, the museum and Ms. Anderson were able to identify where the people came from, what kind of work they did and approximately how old they were. 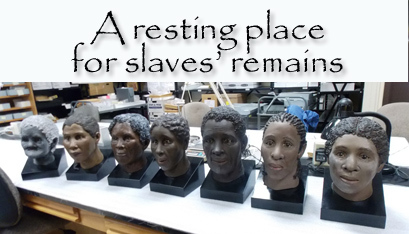 Disease, hard work, trauma and nutritional imbalances were evident in the slaves' remains. Of the 14 sets of remains that were found, six were female, one was male and the rest were children or infants. Most of the remains were those of slaves either ages 25-35 or 40-50. One woman was much older. The bioarcheologist noted that two of the women had grooves in their mouths, suggesting that they smoked a pipe. This would suggest that the Schuyler family allowed their slaves that liberty. The archeologists at the State Museum also learned about the slaves from Schuyler Flatts by looking at some of the items or tools they were buried with, such as the nails in their original coffins, which were made in the mid- to late 1700s. "We're very interested in local history," said Ms. Anderson, but museum staff have not always been able to study events that happened right in the Capital Region. The Schuyler Flatts People are allowing historians to get a better perspective of what it was like during the 18th century in the area. The conditions under which the slaves may have lived were outlined to some extent in the book "Memoirs of an American Lady" by Anne Grant, the cousin of Gen. Schuyler's wife, who stayed at the Schuyler Mansion for a time in the 1770s. The book mentions two women who came to the estate as slaves directly from Africa. "Each family had so few [slaves]," Ms. Grant claimed in her memoirs, citing no more than "two or three" per family in Albany and asserting that the slaves were "happy in servitude." Ms. Anderson told The Evangelist that local authorities believe there are many, many more remains of slaves on the Schuyler Flatts property. However, they will not be unearthed to transfer elsewhere unless similar municipal work necessitates that. As a professional genealogist I was emotionally moved by this article. I was born and raised in Albany, NY yet never read a single article about the slaves who served wealthy, local residents. Finally, they are recognized and honored for their contributions! Many of my own ancestors are buried in St. Agnes Cemetery and the next time we come through town we will head up to Founder's Hill to honor these souls. Thank you for bringing this story to our attention. This comment has been hidden due to low approval.